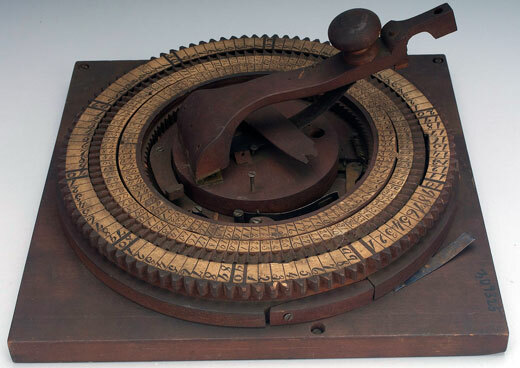 In 1874, Elmore W. Taylor of Franklin, Indiana, patented a circular adding machine (US patent 155772), assigning one-half to his brother Richard T. Taylor. The patent model of the device (up to 1880, the US Patent Office required inventors to submit a model with their patent application) is still preserved in the National Museum of American History, Washington, D.C. (see below). This is the only survived device and it obviously never became popular. 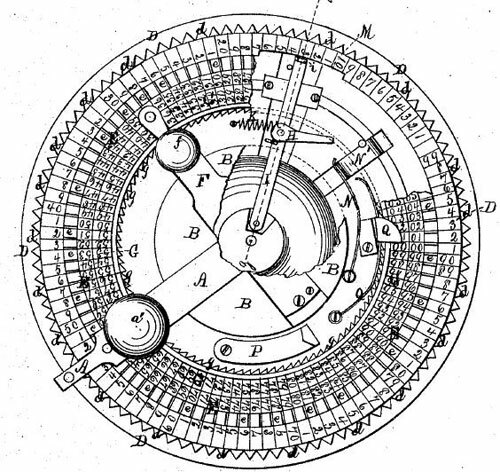 The adding machine of Elmore Taylor is a circular adder, made by wood, metal and paper, with overall measurements: 14.5 cm x 30.5 cm x 30.5 cm. It is intended to be used for adding columns of figures, two places at a time. Its wooden base supports three concentric wooden rings and a central mechanism. The outer fixed ring has a serrated outer edge. The 100 serrations are numbered from 1 to 99 (the 0 serration isn't numbered) on a paper ring fixed to the surface of the ring. Inside this ring is a movable ring, grooved or notched with 100 upward-facing serrations around its edge. These are numbered on the adjacent piece of paper from 00 to 99. Inside this ring is a third fixed ring, serrated on the inside, and also carrying a numbered slip of paper numbered from 00 to 99. Two wooden arms are mounted on a rotating wooden platform at the center of the instrument. The larger arm is designed to link to the two outer rings and the smaller one to the middle ring only. The machine has a carry (by means of a pivoted arm and a pawl) from the tens to the hundreds place. The information for the inventor is very scarce. Elmore (or Elmer) W. Taylor was born in 1847 in Franklin Township, Johnson County, Indiana, in the family of John W. Taylor (b. 1810) and Nancy Taylor (b. 1811). Elmore had 3 sisters (Aletha A., b. 1840; Mary E., b. 1844, and Hannah J., b. 1849) and 2 brothers (Pierson T., b. 1834 and Richard T., b. 1843). Elmore married Margaret A. Toner (born 1857) on October 5, 1876. In 1880s he lived in Detroit, where he worked as a photographer. Elmore Taylor is a holder of 5 US patents (besides the adding machine, he patented also evaporator (1866), advertising device (1880 and 1883) and roller skate (1882)).